Alex Anderson has tremendous material wisdom in his hands and a penchant for barbed beauty. The ceramic sculptures in his intriguing show "Wonderland" at the L.A. gallery Gavlak slip in and out of familiar categories, settling uneasily in memory and enduring as strong, ambivalent impressions. Textures are striking. Anderson oscillates between matte and glossy glazes, in a spare palette of black, white and gold. The pieces, on pedestals and on the floor, marry an industrial look — contemporary, sturdy, spare — with ornate, baroque flamboyance. Sloppy craft may be a popular idiom these days, but Anderson opts instead for the pristine and immaculate, even as he draws from a hodgepodge of visual sources: the sprightly, cartoonish forms of the Japanese superflat aesthetic; the oversized frowning lips of blackface minstrelsy; offensive racial stereotypes and saccharine cuteness. Throughout his work, seduction consorts with repulsion, innocence with threat. "Your Last Meal" (pictured at the top of this review) is an exquisite vanitas, a still life spiked with symbols of sensory pleasure and mortal finitude. 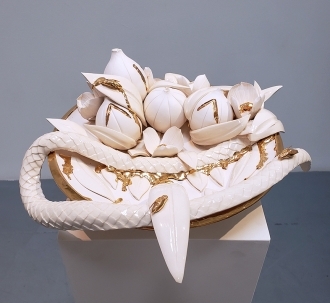 The white dish is rimmed in gold and holds figs and blossoms — but also a snake and pesky flies. Gold drips from the fruit and beneath the snake like the leaching of vital juices. “Black Heart" reads as a tainted valentine, creepily sentimental and irresistibly gorgeous. An orb with sawtooth mouth clenches a snake, whose head disappears into a cut-out heart flecked with blossoms and flies. Pop buoyancy meets archetypal doom. Elegance mates with the egregious. Anderson, not yet 30 and fresh from the MFA program in ceramics at UCLA, puts his abundant technical facility to dazzling use, making work of unresolvable ambiguity and rich multiplicity. He has fashioned a fascinating style to speak not only to his own racial and cultural inheritance, but also to the deeply disturbing and the superficially sweet.